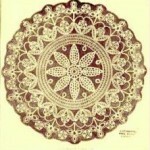 This vintage crochet doily pattern is over 120 years old. It uses the same definitions for stitches that we are familiar with. The only change is it uses a T to indicate where you should make a treble crochet stitch. 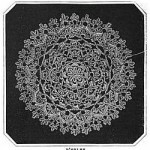 This crochet doily pattern makes a central flower surrounded by rows of leaves. 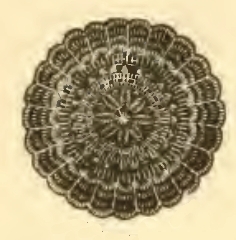 The central flower is two layers deep so this vintage doily pattern may not be the best choice if you plan on using it under a vase or figurine. 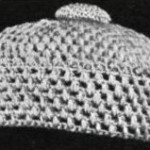 Unfortunately, the book only included a small picture of the finished doily and when that picture was scanned some sections did not turn out well. 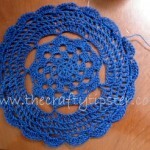 I’ve increased the size in hopes of providing you with a bit of an idea what the finished doily will look like. It’s my hope that if anyone gives this pattern a go, they will let me know of any problems they encountered or share a picture of their completed crochet vintage doily so that I may post it here for everyone to see. 1st Row: s.c. 16 times into the ring; join. 2nd Row: sc. 4 d.c. into the second stitch; ch.1 * d.c. into second stitch; ch.1 repeat from * until you have 16 d.c. around ring join. 3d Row: set needle under chain between first two doubles, s. c. the stitch ch. 10 * d. c. down the chain 9 doubles, skip one hole; set needle into the second hole, s. c. the stitch ch. 10, repeat from * until you have 8 half leaves around the center; join. 4th Row: d. c. up opposite side of chain 9 doubles, ch. 1 sl. st. down on the other side, taking up back half of stitch * d. c. up the next half leaf, 9 doubles ch. 1 si. st. down, repeat from * until the 8 leaves are finished. 5th and 6th Rows: These rows of leaves are made same as the preceding row only set needle in back of first row and the s. c. is made into holes skipped by the first row of leaves; when this row is finished, break the thread; join into top of upper leaf. 7th Row: ch. 6 join into top of lower leaf, ch. 6 join into top of upper, repeat until the row is finished; join. 8th Row: ch, 4 d. c. into second stitch; ch. 2 * d. c. into second stitch ch. 2, repeat from * all around. 9th Row: ch. 4 d. c. into same stitch with chain ch. 3 into 6 repeat from * when you finish this row, there should be 24 V shaped places around the wheel. 10th Row: ch. 2 d. c. into first V shaped hole, * ch. 4 s. c. into top stitch of double crochet, ch. 4 s. c. into same place, ch. 4 into same place; ch. 2 s. c. under the chain between the V shaped places; ch. 2 d. c. into next V shaped hole repeat from * all around; when finished there will be 24 little leaves around the wheel. 1st Row: join thread into top loop of one of the little leaves, ch. 7; join into top loop of next leaf, ch. 7; repeat all around. 2d Row: ch. 4, d. c. into third stitch; ch. 2 into third, chain 2 between and into every third stitch all around. 3d Row: ch. 4, d. c. into top of each double of preceding row with 2 ch. between all around. 4th Row: ch. 8, * d. c. 3 times into first hole; 3 d. c. into the next, 1 d. c. into the next; repeat from * all around. 5th Row: ch. 3, * T into top of 6 doubles; 3 times ch. 1 T into same place; 3 times s. c. between the 3 and 1 double of preceding row; 1 d. c. on opposite side of one double, repeat from * until this row is finished. 6th Row: ch. 3, 3 T into center shell, * ch. 1, 3 T into same place; 1 d. c. between the s. c. and d. c. of preceding row; 3 T into top of next shell and repeat from * to end of row. 7th Row: ch. 3, d. c. setting needle into hole back of 3 ch. twisting the stitch; 1 d. c. between every treble with 1 ch. between, going twice into the top of shell and between shells; twist the stitch by setting the needle in at the left of double of preceding row, then back to the right of it. 8th Row: 1 s.c. between each double with 1 ch. between all around.